Horrid Henry finds a surefire way of wielding the remote control to ensure he always watches his programme of choice. He also vies with Moody Margaret to become the head of the school, shows off his prowess as a magician in the school talent show, and battles it out with Perfect Peter over who gets the green dinosaur and who gets the purple one. 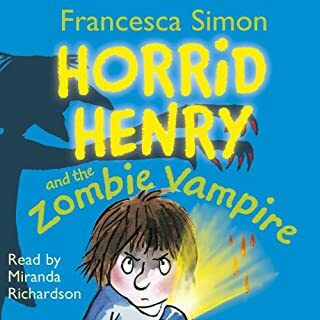 Four new stories in which Horrid Henry terrorizes his classmates at a school sleepover in the museum; plays with Perfect Peter and tricks him into handing over all his money; gets out of writing his own story for Miss Battle-Axe by adapting one of Peter's; and meets the Nudie Foodie, a celebrity chef, who comes to the school to improve school dinners. No more burgers! No more chips! Four hilarious new HH stories - HH's Mother's Day, probably not the day his mum looks forward to most in the year, HH's Nightmare where Henry's chased by a ghost bunny with huge teeth, a wailing graveyard ghost and, for good measure, a slimy zombie, then a new story about one of his greatest enemies in The Return of the Demon Dinner lady and last but not least Fluffy Struts Her Stuff. 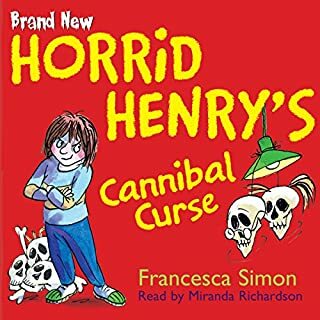 The final collection of four brand-new, utterly horrid stories in which Horrid Henry triumphantly reveals his guide to perfect parents, reads an interesting book about a really naughty boy and conjures up the cannibal's curse to deal with his enemies and small, annoying brother. Read by Miranda Richardson. 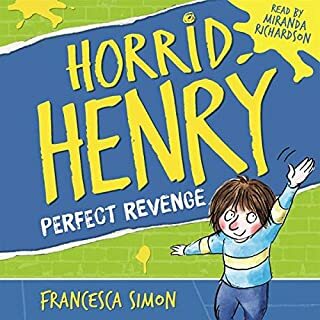 Horrid Henry has a bad day and runs away, only to be lured back by pancakes; he cheats in every possible way at sports day; he thinks of a novel way to get rich quick, and ensures by devious means he gets what he wants for Christmas. A brilliant collection of four stories about this favourite character, one of the few new characters to have emerged in recent years for this age group. Four fabulous new stories: Horrid Henry builds himself a time machine and tricks Perfect Peter, Perfect Peter strikes back, Henry eats snails at Restaurant Le Posh, and is dragged out on a horrendous hike. 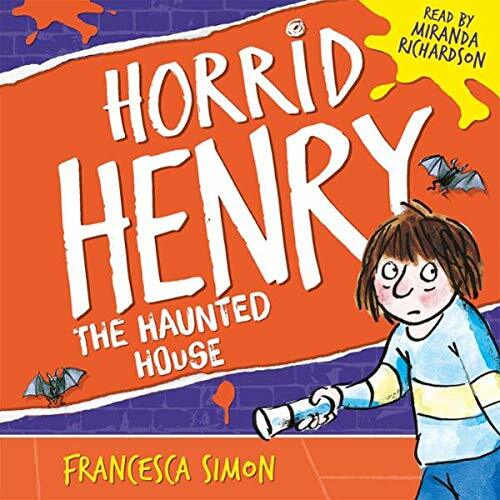 Listen as Horrid Henry makes his own scary movie; persuades Peter to hand over his stash of Grump Cards (as a brilliant scheme to get him out of the punishments his parents give him); and spends a weekend at Aunt Ruby's where he has to share a bedroom with his two arch-enemies, Stuck-Up Steve and Bossy Bill. Follow along as Henry's school decides to have a mini-Olympics and Harry sets up his own Holympics, with medals for crisp-eating, TV watching, and Burping to the Beat. 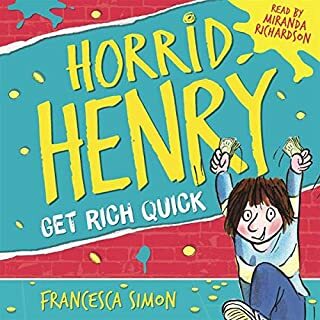 Horrid Henry tries to fool the Tooth Fairy into giving him some money despite the fact that his teeth appear to be "superglued to his gums"; Henry creates havoc as a pageboy at a wedding; Henry gets rid of Moody Margaret, an unwanted guest, and he "breaks in" the new teacher. 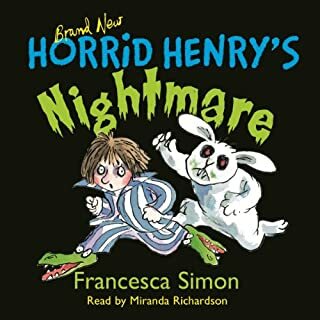 Four fabulously funny stories that will invoke every family's worst Christmas nightmares, as Horrid Henry sabotages the school play, tries to do his Christmas shopping without spending his pocket money, ambushes Father Christmas with some serious accusations, and endures Christmas dinner with the guests from hell. First, Horrid Henry has his courage put to the test when confronted with Nurse Needle and a nasty injection. Then it is rivalry between Henry's and Moody Margaret's Secret Clubs as they try to outwit one another. Four uproarious new stories, enhanced by Miranda Richardson's manic reading and really horrid music and effects, in which the Queen visits Horrid Henry's school and watches the children make wattle and daub; and Horrid Henry tries to hypnotise Moody Margaret, tricks Perfect Peter into doing his household chores, and gets his own way at bathtime. Four hilarious stories with amazing music and sound effects. Henry is dragged to dancing classes against his will; vies with Moody Margaret to make the yuckiest Glop! ; goes camping in France; and tries to be good like Perfect Peter, but not for long. Horrid Henry reads Perfect Peter's diary and improves it; goes clothes shopping with Mum and tries to make her buy him some Rootatoot trainers; is horrified when his old enemy Bossy Bill turns up at school; and tries by any means, fair or foul, to win the class football match and defeat Moody Margaret. When Horrid Henry gets nits and his little brother Peter Perfect doesn't, he makes sure that everyone else gets them too. After that, he can turn his attention to sabotaging the school trip, ruining his parents' dinner party, and terrorizing Peter. Four more stories about everyone's favourite awful child, Horrid Henry. 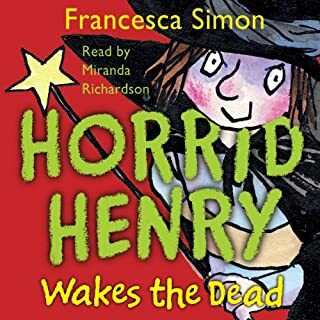 This second "Horrid Henry" audio is read, like Horrid Henry's Nits, by Miranda Richardson (Queen Elizabeth in Blackadder), who brings every character to life in her versatile reading. The stories have sound effects and specially written music. ©1999 Francesca Simon (P)2000 Orion Publishing Group Ltd.